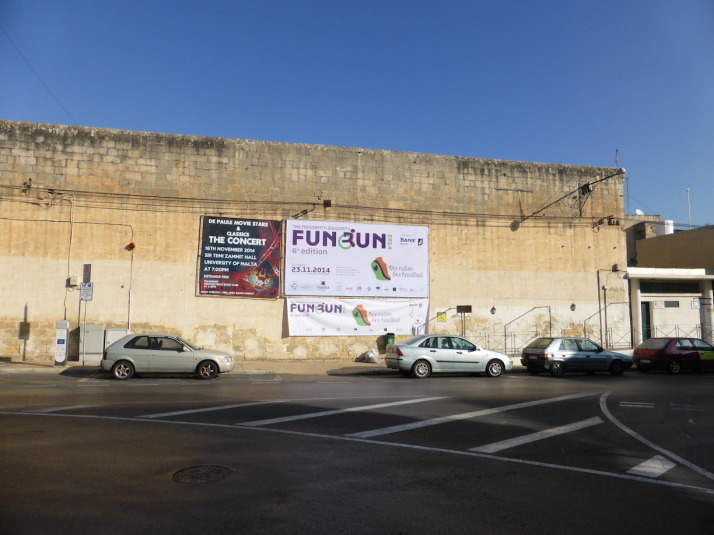 While we were out and about in Malta we spotted giant posters for an annual Fun Run.. I did a little checking when we got back to our apartment and sure enough this annual event, now in its 6th year, was due to take place later that week. I filled out the entry form online (for the Maltese ID card I used my Passport Number), paid my €10 donation, and we found the nearest branch of the sponsoring Banif Bank to pick up my race pack! Now, for all we’ve hiked, cycled, taken the odd dip in the sea and more recently strolled our way around most of Istanbul, I haven’t done any real cardiovascular training for almost a year and the last time I ran an event was the Blaydon Race over 2 years ago so I did wonder how I’d fare! 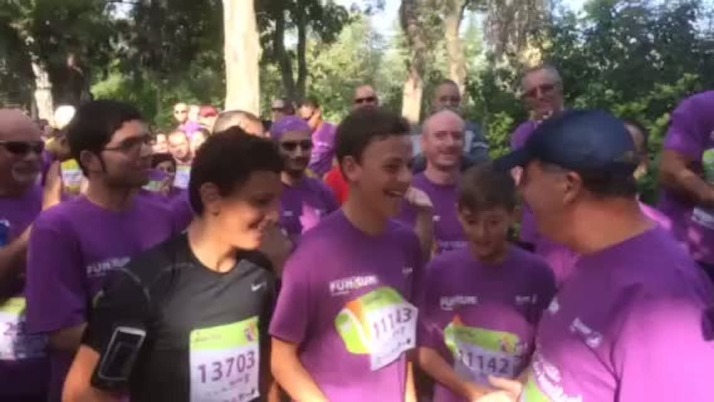 The Fun Run comprises 4 routes – 3 shorter walking courses of about 2km each and the main 7km run which starts at the official residence of the President of Malta in San Anton. I got there early and waited right at the front where I had the pleasure of seeing President Emeritus George Abela of Malta at the starting line! Just after 10am the gates opened, the starter gun fired and we were off! We were all held back to a fairly easy pace by a line of runners with a rope stretched across the road, and trailing a car blaring an eclectic mix of dance tunes and 80’s and 90’s hits, with a Mr Motivator-style DJ encouraging us to raise our arms and sing along. Those who weren’t running lined the streets and the balconies to wave their friends on, and that included the nuns and priests of the convents and churches we passed! The route took an almost straight line from San Anton to Valletta, and there were only a couple of inclines which with the slightly restrained pace made for a pretty comfortable run. We ran the last few hundred metres through the capital to Queen’s “We are the Champions” much to the bemusement of the tourists who were expecting a quiet Sunday mooch. The President’s view of the 16,000 participants of the Fun Run in St Georges Square. Source: President’s tweet! 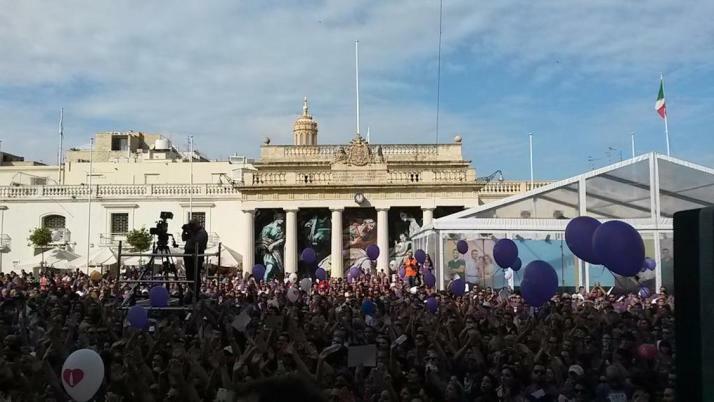 I crossed the finish line and met up with the rest of the record 16,000 participants in St George’s Square, where a sea of purple people bounced up and down in front of the stage set up for the event. It was really good fun to be part of the ‘One Nation’ for a morning at least, thank you Malta! 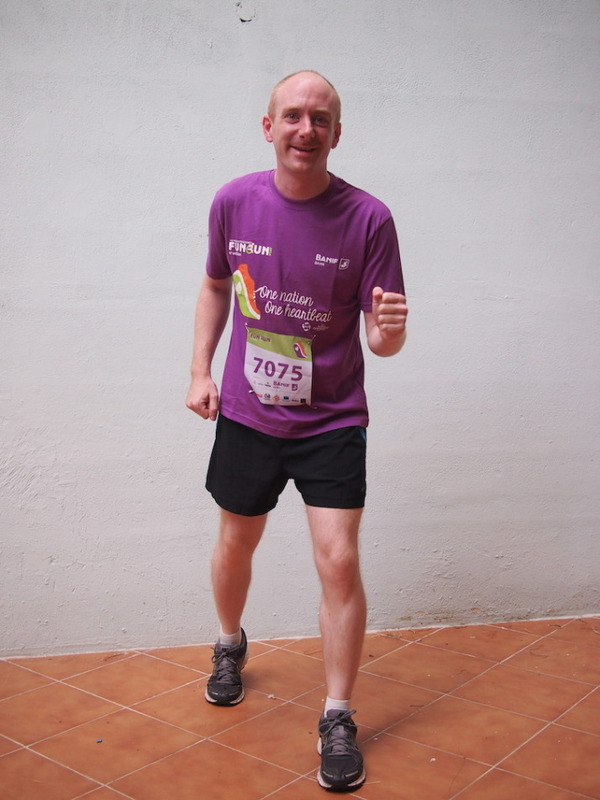 This entry was posted in Experiences and tagged Malta, Running, Valletta on December 7, 2014 by Andrew.